Mexico is not only the nearest destination abroad for U.S. and Canadian expats; it is also one of the most popular. More than a million expats are estimated to live in Mexico full- or part-time…the largest concentration of North American expats anywhere in the world. Of course, it helps that Mexico is also one of the largest countries in the Americas, offering just about any climate, geographical landscape, and lifestyle you might want. As a result, you’ll find expats scattered all over Mexico. But some places have proven to be especially popular, with an appeal that makes them stand out from the crowd. For many North Americans, say “Mexico” and they think of white-sand beaches. That’s not surprising. Mexico has nearly 6,000 miles of coastline, much of it beautiful beach. If you’re looking for a beach lifestyle, Mexico will have you spoiled for choice. For classic white-sand beaches and turquoise waters, it’s hard to beat Mexico’s Riviera Maya. This 80-mile stretch of coast runs along the Yucatán Peninsula from Cancún to Tulúm. Little beach towns are scattered all along the coast…and one—Playa del Carmen—has grown to become a city. One of the fastest-growing destinations in Mexico, Playa, as it’s known locally, offers a laidback beach vibe…and the upper-end shopping and restaurant scene of a larger city. To enjoy small-town (but upscale) beach life on this coast, head to Tulúm. Once the domain of backpackers, Tulúm today attracts fashionistas and other trendsetters who come to get away from it all. Today you’ll find rustic, palm-thatched palapasalongside gourmet restaurants here…and a beach that’s considered one of the world’s most beautiful. 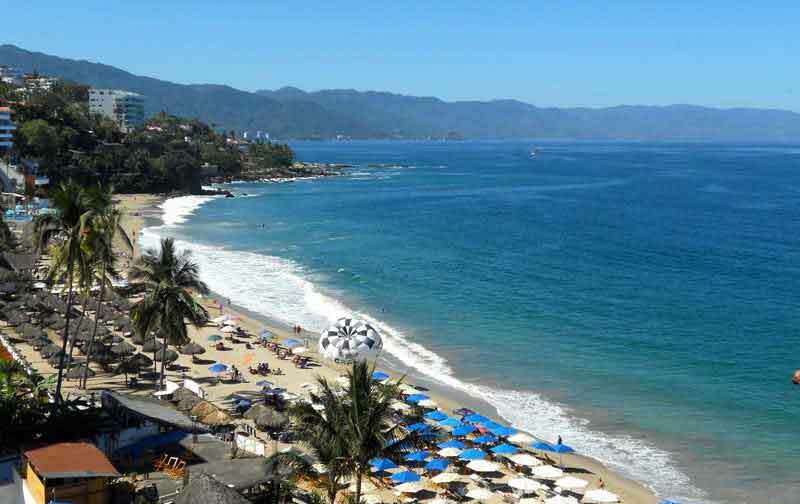 Puerto Vallarta, on Mexico’s Pacific Coast, has been an international beach resort for more than 50 years. Once a small fishing village, today the greater Vallarta area stretches for nearly 30 miles along the shores of Banderas Bay, one of the world’s largest bays. This area offers pure First-World living, with shopping, restaurants, and real estate at every price point; an international airport; and a large, international expat community. Beaches and a long malecón (esplanade) border large swaths of the city. But Puerto Vallarta offers so much to do—from zip-lining and horseback riding in the hills, to fine dining and recent film releases in town—that you’ll have plenty to do, even if you never put a toe in the water. If you want big-city life with the beach a short distance away, there’s Mérida. Capital of the Yucatán Peninsula, this city of nearly a million residents lies about half an hour from the Yucatán Gulf Coast. Small villages dot this placid coast. This is where Mérida’s middle-class families have summered for generations. Today expats have joined them, but many towns still have a family-oriented feel. Don’t look for boutique shopping or dining here, but if you’re seeking a laidback beach life at still-low prices, you can find it here. Not everyone wants to live on the beach…. If you prefer temperate weather and Spanish-colonial style, then Lake Chapala or San Miguel de Allende, both in central Mexico, may fit the bill. Lake Chapala has an enviably near-perfect climate—spring-like almost all year—and a large, diverse expat community. And being near Guadalajara, Mexico’s second-largest city, means easy access to its international airport and excellent medical facilities. San Miguel, about three hours north of Mexico City, is a beautifully preserved Spanish-colonial town that offers art galleries, gourmet restaurants, a wealth of arts and crafts, and a large expat community. No country is perfect, and Mexico has gotten more than its share of knocks. But yes, some parts of Mexico should be avoided, while others are just not worth your time. Some Mexican states bordering the U.S.—notably Tamaulipas, Coahuila, and Chihuahua—have vast, empty interiors where you can be at the mercy of accidents and bad weather. If you’re looking to drive down into central Mexico or farther south (and many expats do), consider checking routes through other Mexican states like Nuevo León, Sonora, and Baja California. Acapulco was once one of Mexico’s top beach resorts, but age and scattered violence has dimmed the city’s glitter. If you want to stay on the beaches of Acapulco’s home state, Guerrero, head north to Ixtapa-Zihuatanejo. Finally, Tabasco may be a famous hot sauce, but the Mexican state is largely humid, low-lying land. It’s the boring, often wet stretch you’ll pass if you’re driving from central Mexico to the Yucatán Peninsula. Tabasco’s capital, Villahermosa, is a major business city, headquarters of Mexico’s oil industry and home to several museums. Take a quick look if you’re inclined…but with so many interesting places both north and south of it, you probably won’t want to linger. Should one avoid living in Tabasco because of its humid, low-lying land, and its lack of exciting life style. Are those the only detterents; how safe is it? It seem as if it would suit people who want a quiet lifestyle, and to be away from the fray. Some love the action of the tourist zones in Mexico. Some love the cities. Some love the rural more quiet areas of the country. The good news is Mexico is a very large country with 120 million people. From the north west to the very south east, its’ about 2500 miles. So there is plenty of options for whatever lifestyle you seek. Specifically related to Tabasco, it’s a great place to live Safety? Well, like all things, you need to be smart and not flash wealth. Just fit in and add the Expat911 App for extra safety and you’ll be good to go.